Like most successful businesses, you’re constantly trying to maintain a healthy balance between the day to day grind while also planning for the future of your business. We want you to know, we’re here to help you every step of the way. 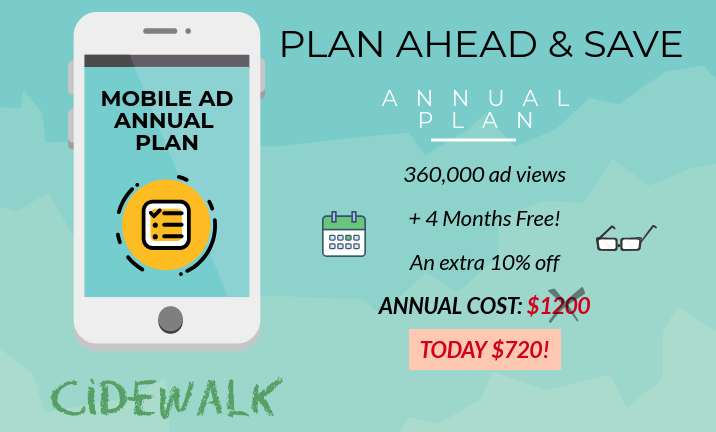 Not only should mobile advertising be simple, we want to also take the challenge out of how to plan ahead with your mobile advertising too! How did we do it? On top of our 1-2-FREE offer, you can enjoy 4/12 months free (that’s 120,000 ad views on us) and an extra 10% off if you sign up today!